Biznextindia : The Eight core sectors grew at their slowest pace in the last 18 months at 2.6 per cent in December 2018 due to decline in output of crude oil, refinery products and fertilisers, according to the data released by the ministry of Commerce and Industry today. The previous lowest expansion in output of these key industries was recorded in June 2017 at 1 per cent. 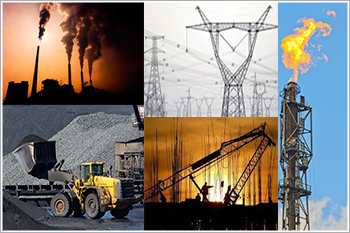 The growth rate of the eight infrastructure sectors — coal, crude oil, natural gas, refinery products, fertilisers, steel, cement and electricity — stood at 3.8 per cent in December 2017. Coal production (weight: 10.33per cent)increased by 0.9 per cent in December, 2018 over December, 2017. Its cumulative index increased by 7.8 per centduring April to December, 2018-19over corresponding period of the previous year. Crude Oil production (weight: 8.98per cent) declinedby 4.3 per cent in December, 2018 over December, 2017. Its cumulative index declined by 3.7 per centduring April to December, 2018-19over the corresponding period of previous year. The Natural Gas production (weight: 6.88per cent) increased by 4.2per cent in December, 2018 over December, 2017. Its cumulative index declined by 0.1 per centduring April to December, 2018-19 over the corresponding period of previous year. Petroleum Refinery production (weight: 28.04per cent) declined by 4.8 per cent in December, 2018 over December, 2017. Its cumulative index increased by 4.1 per centduring April to December, 2018-19over the corresponding period of previous year. Fertilizers production (weight: 2.63 per cent) declined by 2.4 per cent in December, 2018 over December, 2017. Its cumulative index declined by 1.4 per centduring April to December, 2018-19 over the corresponding period of previous year. Steel production (weight: 17.92per cent)increasedby 13.2 per cent in December, 2018 over December, 2017. Its cumulative index increased by 4.7per centduring April to December, 2018-19 over the corresponding period of previous year. Cement production (weight: 5.37per cent) increasedby 11.6per cent in December, 2018over December, 2017. Its cumulative index increased by 13.9per centduring April to December, 2018-19over the corresponding period of previous year. Electricity generation (weight: 19.85per cent) increased by4.0per centin December, 2018over December, 2017. Its cumulative indexincreased by6.3per cent duringApril to December, 2018-19over the corresponding period of previous year.